“Yellow/ Nomadic Canopy” is an installation for an art exhibition. The project is a hybrid: (1) a studio investigation into nuclear waste and also a (2) commentary on political protests. An animated film “yellow” accompanies the installation. The goal is to create and interpret a vision of the fantastic. “Yellow” is a hypothetical design for a nuclear marker: an architectural object that marks the site of nuclear waste stored underground. The marker must last 10,000 years due to radioactive half-life. After extensive research, I proposed a radical scenario: a retro-fitted oil rig, commanded by climate refugees of Pacific islands, will sail on the world’s oceans collecting waste and bury it under the seabed. The mehanical rig is a nomadic island - populated by displaced, wandering peoples for the first few centuries, then later becoming a sentient being itself. The film “Yellow” follows this story. “Nomadic Canopy” is a commentary on political protests. 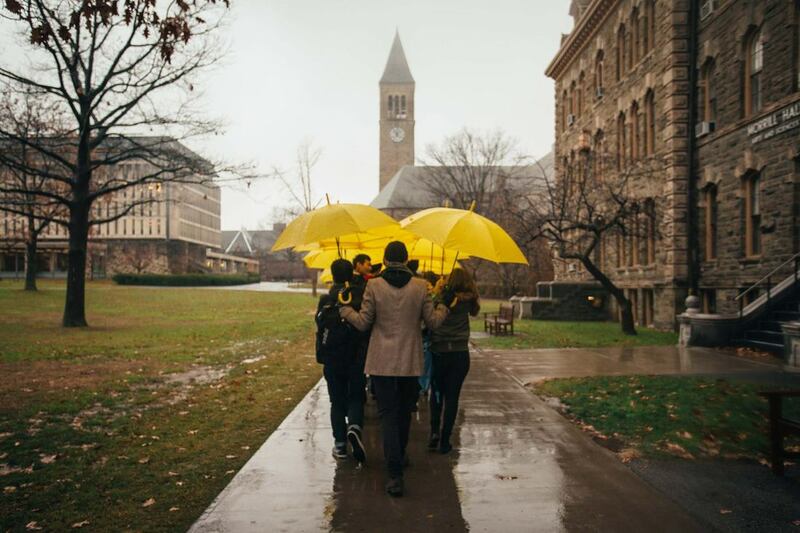 Inspired by the democracy protests in Hong Kong, I designed a canopy of yellow umbrellas. The canopy would take the dimension of the film gallery: two rows of ten umbrellas would be connected with fabric, forming a mobile roof and colonnade. 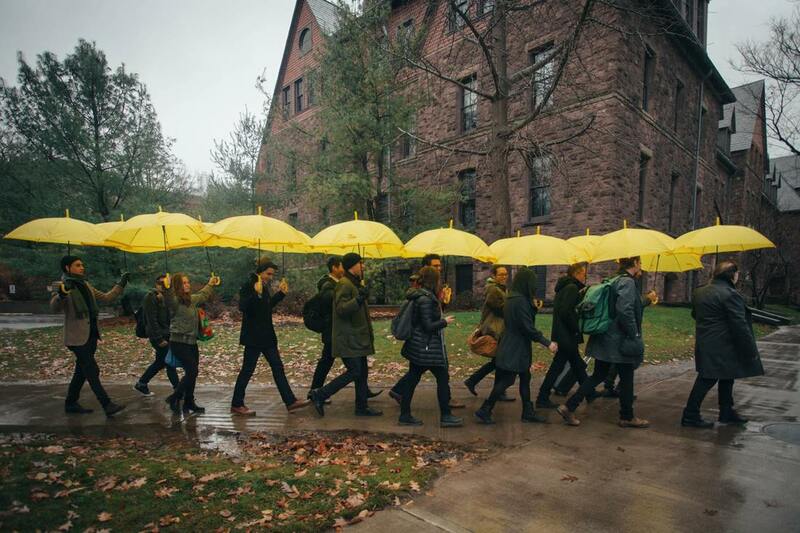 Students and critics would “walk” the umbrella roof across campus, from the studio to the art gallery, in a procession. The umbrellas would then be hung on the gallery roof and create a surreal “underwater” ceiling for watching the film “Yellow”. For “Nomadic Canopy”, the procession of umbrellas represent solidarity with protesters and raises public awareness. For “Yellow”, the canopy is a metaphor for the floating nuclear island: transport people from reality to the world of fantasy (the film and gallery), or transporting waste from cities to the underwater world. Yellow is also the color of danger and the nuclear symbol. The umbrellas become a pop-up micro public space, a “guerilla” transporter for students and exhibition-goers. Once upon a time, a great nation learned to wield the power of atoms, the building blocks of the universe. It used the energy to wipe out its enemies, but soon other nations learned to harness the power of the particles as well. To keep their peoples safe, the nations experimented with the particles in the middle of the Great Ocean, causing great plumes of fire and destruction. Unbeknownst to them, the destructive plumes poisoned the land and the native peoples of the islands, leaving them radioactive for generations – 10,000 years, to be precise. Ashamed, the leading nation tried to purify the poisoned land; they built a great stone dome, 110 m in diameter, in the middle of the Great Ocean, to bury the poisoned land. The dome temple is called CACTUS, inscribed 1979. The nation paid the poisoned peoples and silenced them. A while later, the great nations forgot about war and desired wealth from trade. They turned the Great Ocean into a highway; through flying ships, sailing ships, and undersea wires, the vast ocean distances collapsed. The ocean became a small sea, and the sea became a backwater pond. Soon, the collective speed of travel warmed the Ocean, causing waters to rise. The stone marker and the islanders were forgotten. Meanwhile, the great nations turned the fearsome atom into power for industry, placing the poisoned byproduct – nuclear waste - into metal capsules. The nations produced thousands of these nuclear waste capsules. Soon, the capsules began to cover the Earth’s surface, and the islands began to sink…. Thus began Year 1 of the Nuclear Era.